A key party in Pakistan's ruling coalition has said its two ministers are quitting the federal cabinet, dealing a major blow to the government. The Muttahida Qaumi Movement (MQM) cited corruption and rising prices as the main reasons behind its decision. It said it would decide soon whether it would leave the coalition altogether. 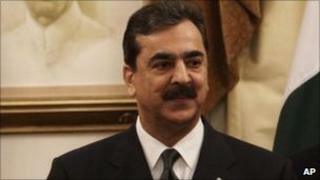 The move comes just weeks after a smaller coalition partner left the cabinet of PM Yusuf Raza Gilani led by his Pakistan People's Party (PPP). "As a first step, it has been decided that both our federal ministers are leaving the cabinet," the MQM, the second-largest political party in the coalition, said on Monday. "As far as the decision to part ways with the federal government and the future relationship with the provincial government (in Sindh) is concerned, a decision will be taken soon." If the MQM, which dominates the political scene in the city of Karachi, leaves the coalition, Mr Gilani's government would lose its majority in parliament. The coalition currently holds 181 seats - including the MQM's 25 - in the 342-member parliament. This is just nine more than the 172 needed to preserve its majority. The cabinet is also struggling to implement reforms needed to secure a new tranche of an $11bn (£7bn) loan by the International Monetary Fund to keep afloat the country's fragile economy.